Buzz has surrounded the former California Attorney General ever since she defeated fellow Democrat Loretta Sanchez to become the first ever Indian-American to reach the Senate. Top that achievement off with well-delivered platitudes about pragmatic resistance to President Donald Trump’s agenda, and the conditions are ripe for a cult of personality. But Democrats would do well to avoid what is sure to be a disaster, should Harris decide to run. Already her name inspires rumblings of dissatisfaction from the progressive wing of the party, which does not bode well considering what it meant for Hillary Clinton and Jon Ossoff. Harris’ biggest problem is that she is seen as a corporate Democrat. That image probably has something to do with the large sums of industry money she accepted last election. According to Maplight, which describes itself as “a nonpartisan, 501©(3) nonprofit organization that reveals the influence of money in politics, informs and empowers voters, and advances reforms that promote a more responsive democracy,” in the 2016 election cycle, Harris received $41,900 from telecommunications companies (calculated by adding “telecom services” and “telephone utilities), $26,783 from commercial banks, and a whopping $626,869 from securities and investment interests. She even took $12,991 from oil and gas! Fans of the freshman California Senator have been quick to point out that she has taken some genuinely progressive positions. Medicare-for-all isn’t the only bill of Sen. Sanders’ which she has co-sponsored. She also joined him on legislation to make public colleges and universities tuition free. Others have also pointed out that the donation figures represent donations from individuals within each industry as opposed to the companies themselves. However, the Senator’s corporate ties are real. Harris has attended multiple fundraisers hosted by lobbyists, during and after the election, including one last month in the Hamptons. All told, during the 2016 election cycle, lobbyists donated $135,613 to her campaign. Those donations came from individuals representing a plethora of corporate interests—from big pharmaceutical companies and Wall Street banks to health care companies and telecommunications giants. One of the Senator’s donors, for example, is a man by the name of Darius Anderson, the CEO of Platinum Advisors, whose clients include the global pharmaceutical company Allergan PLC. Another, James C. Free of Smith-Free Group represents Bank of America and the Hospital Corporation of America. Now, at first blush, the amounts of these individual donations might not seem all that concerning. However, in comparison to regular donors, lobbyists tend to have more influence. The secret to their power is twofold. But perhaps the biggest reason for their prominence is the fact that lobbyists are ambassadors for larger monied interests. They often serve as gatekeepers to large fundraising networks and super PACs. As such, they have been known to present elected officials with gifts including vacations and even future multi-million dollar job offers. “There’s very rarely a quid pro quo, but it’s understood,” Schain explained, cautioning that it is difficult to measure influence. The extent of Senator Harris’ relationship with her lobbyist donors is unclear, but their number and the fact that she tends to play it cautious on issues that affect their clients, is likely to put a lid on any presidential aspirations she may have. 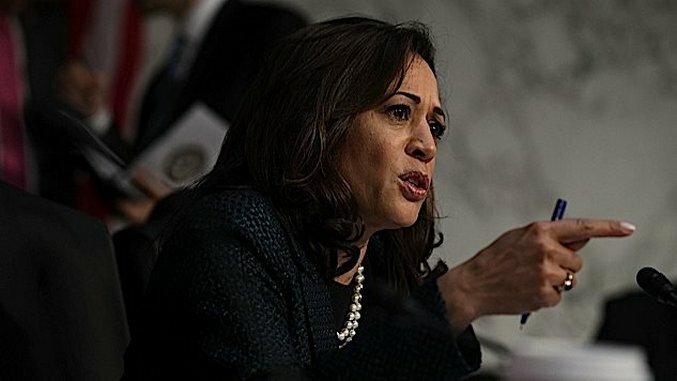 Although adaptability is a net positive, Harris has a tendency to mask caution with subtle jabs at those on the left calling for change—a tactic borrowed from Bill Clinton in the 90’s and reused by Hillary in 2016. “We can’t afford to be purists,” she once told a crowd of her constituents. With the Democratic Party divided along the fault lines exposed during the primary, both sides are looking to field the unifying candidate so as to control the direction of the party going forward. It is understandable then, why some would turn to Harris. An accomplished individual, she presents a strong public image and speaks with authority. But for now, she’s too conventional. She appears too comfortable with the party’s status quo. As we’ve already seen, that kind of Democrat doesn’t defeat Trump.